Mix marinade ingredients together in a large bowl. Add mushrooms, chicken and peppers and stir until well coated. Cover and leave to marinate for at least 30 minutes,stirring occasionally. 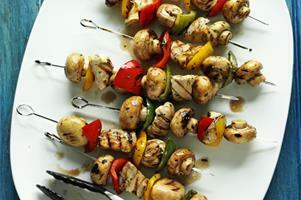 Thread onto 8 skewers alternating the mushrooms,chicken and peppers. Cook on a sheet of foil on a medium hot barbecue ( or under the grill )for about 6-7 minutes on each side.